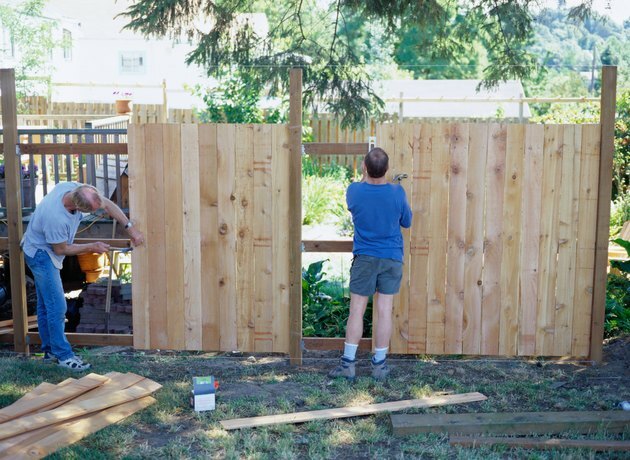 While in the middle of installing a new privacy fence you realize that one of the posts has been set too short. Instead of digging it up and resetting a new post, one thing you can do is to extend the existing post. With this solution, you save time by not having to make a trip back to the store to purchase another post and more setting materials. When properly installed, the extended post will be sturdy enough to allow you to complete your fencing project. Extending a short fence post is a time-saving solution. Measure and cut a 4-by-4-inch extension post to the desired length. Use a miter saw to get a precise and square cut. Cut two sections from the 1-by-4-inch lumber to act as braces for two sides of where the old post and extension will be joined. The length of the braces depends on the length of the extension. The brace should be long enough to extend half the length of the post extension above and below the joint. For example, if you are extending the old post 1 foot, cut the braces 1 foot long. This will give you 6 inches above and below the joint. For a 2-foot extension, cut the braces 2 feet long, allowing 1 foot above and below the joint. Cut two braces from the 1-by-6-inch lumber to match the lengths of the other two braces. When the 1-by-4-inch braces are attached to opposite sides of the post, two sides will now measure 6 inches wide. These 6-inch-wide braces will be attached flush with the other sides making a 6-by-6-inch post around the extension joint. Place the post extension on a flat surface. Take a 1-by-4-inch brace and position it so that half of the brace is resting on the extension and half is hanging off. With the edges of the brace flush with the sides of the post extension, drill four to six evenly spaced 1/8-inch pilot holes through the brace and into the extension. Attach the brace with 2-inch deck screws. Flip the extension completely over and attach the other 1-by-4-inch brace to the opposite side in a similar fashion. Take the extension assembly and slide it down onto the top of the old post. Align the bottom half of the brace so that the edges are flush with the sides of the old post. While holding the brace in place, drill four to six pilot holes through the brace and into the old post. Attach the brace with deck screws. Repeat the process and attach the brace to the opposite side of the old post. Position a 1-by-6-inch brace on one of the remaining sides of the extension and old post. Align the top, bottom and sides with the already installed braces. Drill four to six pilot holes above and below the joint. Attach it with deck screws. Repeat the process with the remaining brace on the opposite side of the post. The post extension is now attached and sufficiently braced.